Muscle Strain: Spending too many hours hunched over a computer, reading in bed, or even gritting your teeth can cause muscle strain. Joint Wear: Our joints wear down as we get older. Osteoarthritis causes the cartilage between the vertebrae to break down, placing bone against bone. The bone spurs formed not only cause pain, they adversely affect joint mobility. Injury: The jarring motion of a car accident can lead to whiplash and cause strain to the soft neck tissues. Nerve Compression: Bone spurs and herniated disks located in the neck vertebrae can mash the nerves that branch out from the spinal cord. Disease: Certain diseases, such as rheumatoid arthritis, meningitis, and cancer, can also be the cause of neck pain. No matter what the cause is, it is important to receive professional help, so the problem doesn’t get even worse. Many people think neck and back issues can only be treated with surgery. However, today there are several ways to treat neck pain without resorting to invasive surgical procedures. One of the best non-invasive treatments today is non-surgical spinal decompression. 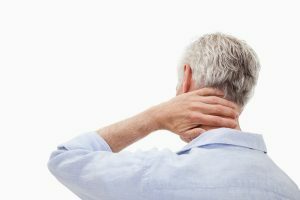 Surgery is not your only choice when it comes to relieving neck pain. With nonsurgical spinal decompression, a chiropractor can gently stretch the spine, taking the pressure off spinal disks by gently stretching the spine. When this happens, herniated disks may retract, releasing the pressure on nerves. This process allows oxygen, water, and other fluids into the spinal disks, so healing can occur. If you are looking for a chiropractor in Edgemere, contact the professionals at Comprehensive Spine & Sports Center. Let our experience and skill help relieve your neck pain today.